Looking for a healthy vegan soup? 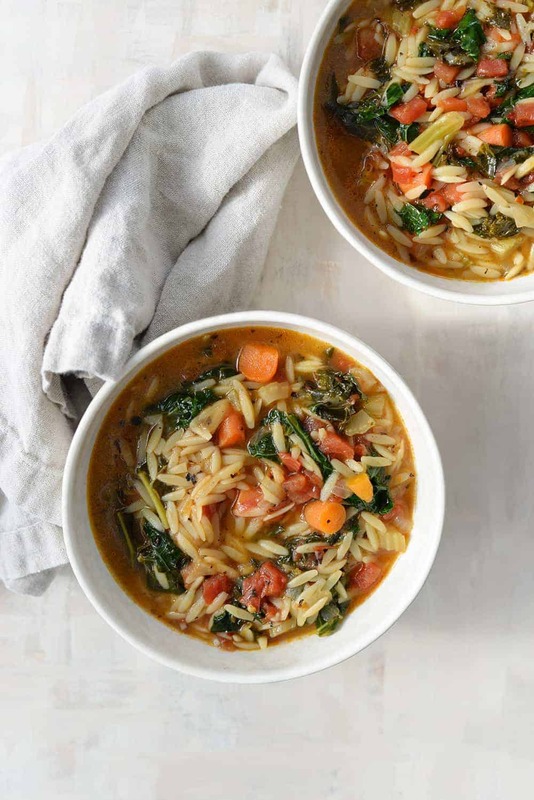 Try this Tuscan Kale Soup made with roasted tomatoes, orzo, kale in a spicy broth. A must make with less than 250 calories a serving. I’m pretty sure that soup is always the answer. This time of year, I want soup for 64% of my meals. I crave it on chilly, snowy nights and the leftovers always make the perfect lunch. 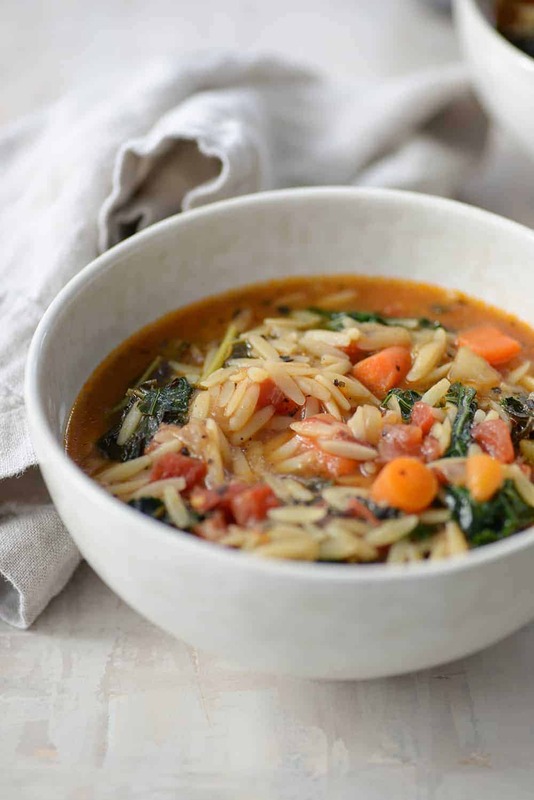 This tuscan kale soup is a medley of some of my favorite winter foods: tender orzo pasta, fire roasted tomatoes and kale in a spicy broth. BL always tells me that my soups are one of his favorite things I make. Which, sometimes feels like an odd compliment. Isn’t soup one of the easiest foods to cook? I find that no matter what’s lurking in my fridge or pantry, I can almost always make a killer soup. These are the tips I rely on every time. The secret to really good soup is of course, really good broth. 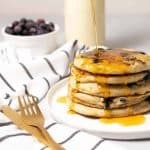 I usually make my own from whatever scraps I have lying around, especially in the age of the Instant Pot.However, there are some great store-bought options that I rely on option. Better than Bouillon makes a good vegetable base that I use when I’m in a pinch for broth. Pacific Foods also makes a fantastic vegetable broth that I stock up on when I find it on sale at Target, Whole Foods or online. As an alternative, I like Trader Joe’s hearty vegetable broth. The only thing I dislike about store-bought broths is that they tend to be really salty; and I prefer to salt the soup myself as I season it. Saute the vegetables first in fat. This is where most of the flavor comes from, especially since we aren’t using any animal products. I do a thin layer of vegetable oil or olive oil on the bottom of the stock pot and let it get nice and hot before adding in the onions, celery and carrots. From there, I let them cook for as long as I can until they are caramelized and browned. If I’m not in a rush, I’ll let them cook over medium-low heat for almost 20 minutes. Just make sure to stir often so they don’t burn. Burned vegetables will ruin the taste of the entire soup, especially if the garlic burns. For an added layer of flavor, I use fire-roasted diced tomatoes instead of regular diced tomatoes. You should be able to find these in the grocery store where the other diced tomatoes are; muir glen is my favorite brand. The smoky flavor tastes great in just about any soup or chili. Stir in lemon juice right before serving. The added acid balances the heat and the salt; it’s my secret weapon in almost every meal. Looking for a healthy vegan soup? 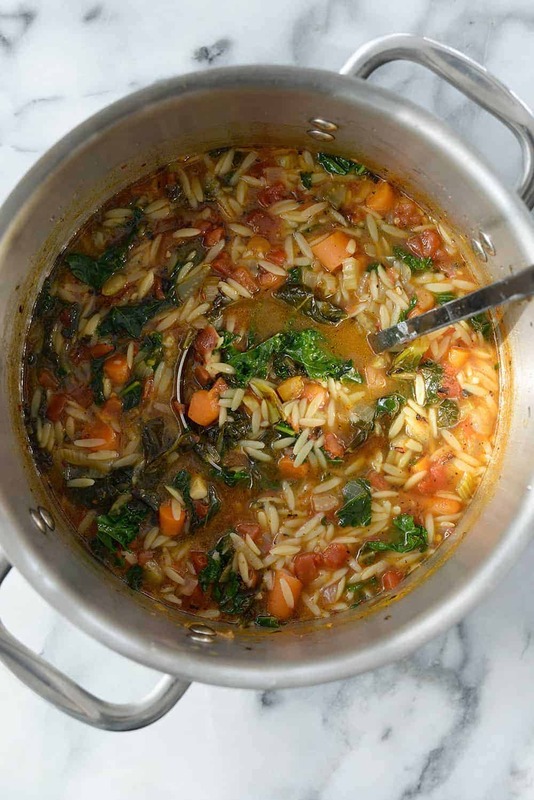 Try this Tuscan Kale Soup made with roasted tomatoes, orzo, kale in a spicy broth. A must make, less than 250 calories a serving. Add the tomatoes with their juice, broth, water and orzo and bring to a boil. 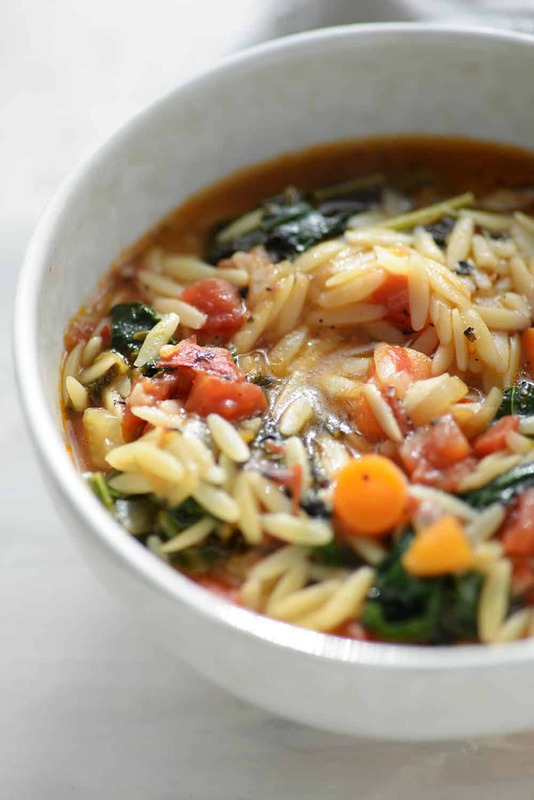 Reduce heat to medium and cook until orzo is tender, about 12 minutes. Stir in the kale until wilted, seasoning to taste if needed. Alex – this was one of our family’s favorites. We have 3 kids – 8, 6 and 3. They all ate this! I loved that I had everything on hand and I did let the veggies sit for about 25 minutes to really brown …. so good! It was delicious and I quite liked the lemon juice at the end to really brighten the dish. This one is a keeper – thank you! Hi Damaris, while soup is a great freezer meal, there’s one component that doesn’t hold up very well when defrosted and reheated: the noodles. Therefore, if you plan on freezing this soup, don’t add the noodles just yet. Instead, wait to add noodles until you take the soup from the freezer and reheat it. This soup is absolutely delicious and very easy to make! It is very filling, full of flavor and has a good amount of spice. 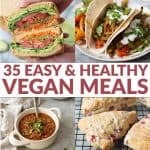 It has been great for lunches and an easy dinner! I did add an extra can of fire roasted tomatoes just because I love tomatoes and did add a little extra kale and all turned out well! Thanks Alex!! I added some cannellini beans to the soup and it was super filling! Great recipe. I made this last night. I added in Cannellini Beans at the very end with the kale. It was delicious and so easy!! Thanks! Love the idea of adding in white beans! Great idea! So glad you liked it. Damn that was delicious. But I did a double take when i saw the price tag on the orzo so I just used rice instead. That probably made it a bit stodgier than yours but all the flavours were still there. The lemon at the end was a bit of a revelation as well. Will definitely make again. Awesome soup. Too sad I cannot find roasted tomatoes around where I live. Can’t wait to make this soup, it looks so good! Curious, where does all the protein come from? The kale? Hi Gina- hope you like it! Yes, the protein (though, not that much) comes mostly from the vegetables and the pasta. Had great flavor! I added garlic flavored roasted tomatoes and it tasted great. Hi Alex! 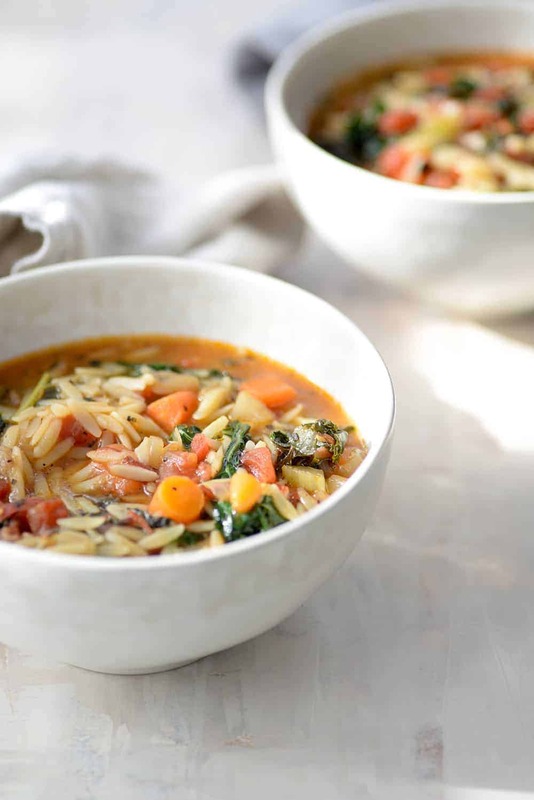 This soup will be a go to soup for us! Great flavor and a perfect weekend dinner and great leftovers for lunch. Delish!!!! Thanks so much! So glad you liked it Mary Beth! Looks great – I’ve made several of your recipes in the last few months and they’ve all been winners! One question, just for the sake of my learning. What’s the intent behind using both broth and water? If the broth is part of the flavor base, wouldn’t it be more flavorful to just use more broth instead of water? Or is there another purpose behind the water? Thanks! So glad you like it Jenny! I usually add in some water with broth to reduce salt/cost overall, but you can use all broth in recipes if you’d like.